Habitat: Chasteberry is a native to western Asia and Mediterranean region. 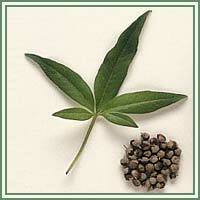 The plant prefers full sun or partial shade and well-drained soil. Description: Chasreberry is a deciduous tree or large shrub, growing to a height of 7 meters. 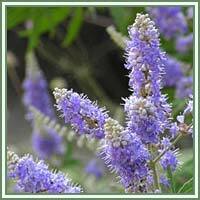 It has palmately compound gray leaves with 5 to 7 fingerlike leaflets, and slender spikes of violet-blue to deep purple flowers. Flowers are followed by a gray to purple fleshy fruit with four aromatic, black seeds, similar to black pepper. The plant is in flower in early summer. Useful components: Alcaloids, essential fatty acids, flavonoids, iridoid glycosides, progestins, volatile oil. Medicinal use: Chasteberry is mainly known as a female hormone regulator. It has a balancing effect on female hormones, making it useful in a wide variety of conditions. Flavonoids found in Chasteberry are now known to affect the pituitary gland, thus regulating estrogen and progesterone levels in the body. Chasteberry seeds can alleviate symptoms of PMS (such as abdominal bloating, mood swings, headaches, breast pain). It can also help in treatment of menopausal symptoms, amenorrhea, irregular menstruation and polycystic ovarian syndrome. Additionally, Chasteberry is used as a remedy for acne, headaches, fever, and is used to promote milk flow and urination. It is also very helpful in cases of night sweats, hot flushes and fatigue. Safety: Do not use the plant without the consultations with a professional.